Please note that the following is a personal review by respected WWM crewmember James ‘Salty Dog’ Gasta. His opinions are his own and not those of WetWebMedia and should not be taken as any kind of promotion or endorsement. 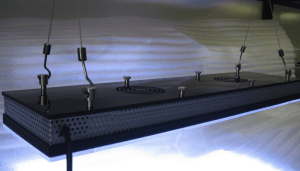 In the last few years, several companies have introduced LED lighting capable of supporting both SPS and LPS corals typically found in reef aquaria. Most of these systems are only effective in shallow tanks, until now. Orphek has spent two years proudly developing their LEDs to provide a PAR/PUR ratio that is much higher than any other LED lighting system currently available, and fully capable of supporting hard corals and clams in tank depths as deep as 48 inches. Orphek is currently working on their own PAR/PUR map to show their extremely high PAR/PUR ratios and the results will be posted on their site when completed (www.orphek.com). All components excluding the timers have been designed and manufactured in house. Two components make up the system, the power supply and the LED module. The power supply is a constant current device and is enclosed within an aluminum housing employing one 3″ cooling fan to ensure a low operating temperature for the electrical components. The unit measures 12 Â¾” x 5 Â¾” x 2 Â¾”. Orphek chose to go with the more expensive constant current power supply because regardless of type, size, or power, all LEDs work best when driven with a constant current source power supply as LED color will change with small variations in driving current. 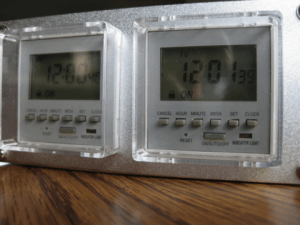 There are two commercial grade digital timers located on the front panel of the power supply. One is for control of the 46 white LEDs, and 10 actinic LEDs. The second timer controls the remaining four actinic LEDs and is used as a night time/moonlight feature. A blue backlight turns on when any of the buttons are depressed enabling one to program in a dimly lit room. Each timer is capable of 16 separate programs which offer an infinite number of timing options for the experimental aquarist. Single days, weeks, or groups of days can be programmed along with individual on/off times for each group. A little overkill, but a nice feature. Each timer can be selected for Auto, Off, and On, which enables one to override the timers if desired. If no entries are made to the timer within 15 seconds, the timer goes into a lock mode which is displayed by a lock symbol and prevents nosy fingers from changing any of the programs or time on the clock. Pressing the cancel button four times unlocks the timer and allows the user to program the timer. My only complaint is that the buttons are small and too close together. I found it fairly easy to press two at the same time while programming. Using the eraser end of a pencil to depress the buttons solved the problem. The timers are also backed up by a battery which maintains timer settings in the event of a power loss, a very thoughtful feature. Another interesting feature is that the timers can be programmed to automatically adjust the clock to compensate for any loss or gain in time. This function is set to automatically take place every Saturday, and is a feature few hobbyists would likely use. As with the power supply, the LED module is equally well made using a combination of Corsica-coated stainless steel and acrylic materials. The sides are wrapped in the stainless sandwiched between a clear 3/8″ thick acrylic lens and a white acrylic back. The clear lens effectively protects the LEDs from any moisture contamination. 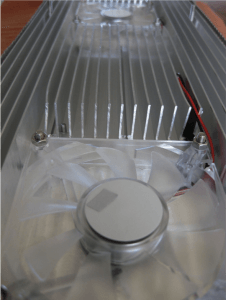 The LED module contains two 3″ cooling fans that effectively cool the LED semiconductors by blowing air across a massive heat sink and out through the perforated side vents in the module. As with all semiconductors, cooler operating temperatures greatly extend the useful life of these components. The module measures 24″ x 6 Â¼” x 2″. Removing the white acrylic top cover revealed how large the aluminum heat sink actually is, it covers the entire length and width of the module. All hardware used for the module assembly is made of high grade stainless steel. There are 60, two watt LEDs used in the module, 14 actinic, and 46 white which effectively produce a Kelvin temperature of around 18,000. The white LEDs are rated at 16,000 Kelvin. Overall, the combined LEDs produce a very nice color balance. The Orphek-lit part of the tank (see photo on the next page) appears to be dimmer than the halide and that is because the pendant was resting on acrylic straps very close to the water’s surface when this photo was taken. Because of its design, and the sharp focusing of the optical lenses, the pendant must be hung and adjusted to effectively spread the light across the width of the tank. The hardware and cables used for hanging the module are included. The combined LEDs offer a full spectral profile of 400nm-760nm which means there is no color loss throughout the entire spectrum, a downside commonly associated with other brands of LEDs. Each LED is outfitted with a 90 degree optical quality lens which greatly reduces water surface refraction and reflection. All connecting pins in the module, including the LEDs, are gold plated for excellent conductivity and to resist corrosion. Mounting in a custom wood canopy is not an option although it is possible with a little ingenuity providing the height is available to spread the light. Orphek recently informed me that they will soon be offering a bracket for the light as well as additional mounting options. On 10/31/10, Orphek has introduced the PR-156W LED Module. This module is identical to the PR-156 but uses frosted 120 degree reflectors rather than the 90 degree clear reflectors used in the PR-156 which was designed for up to 40″ of water penetration. The PR-156W is best used on aquariums 28″ or shallower, (and for those with canopies without a lot of clearance) and will be more economical for those needing spread rather than punch. Above left: I was impressed by the massive heat sink module. Above right: Blue backlighting is very useful for making adjustments in dimly lit rooms. My first impression of the Orphek PR-156 was that it is extremely bright; you could not look directly at the LEDs, much the same effect as looking directly at a metal halide or HQI lamp, you cannot. The quality of materials used and workmanship are second to none. The color of the corals were much more pronounced than my present 10K MH lamps, but not over exaggerated. In three days of use with the Orphek replacing one of my two, 175 watt MH lamps, my tank temperature dropped nearly 2 Â½ degrees. Orphek claims that one PR-156 Module will replace up to a 400 watt metal halide lamp. I had no way to confirm this other than view PAR readings taken with an Apogee AFQ-200 PAR meter at various tank depths (Orphek data) which were impressive. Orphek chose not to include PAR measurements in this review as variance in meters, calibration, applications, water clarity, and angle of mounting could all have an effect on the readings. With an average etailer price of $850.00, this light is not going to appeal to everyone’s needs. 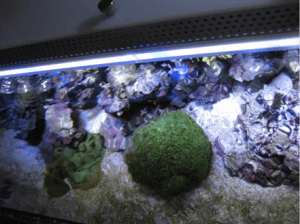 Hobbyists with shallow tanks (<18″) can find more affordable LED systems capable of doing the job. For those with deeper tanks, you will be hard pressed to find another LED system capable of producing the higher PAR levels required. Orphek offers a one year warranty on the power supply and associated electronics, and a three year warranty on the diodes. In the very unlikely event of a component failure, Orphek will provide a new unit and have the defective unit returned in its box so the aquarist isn’t without lighting. Now this is a warranty I can live with. Although the PR-156 is claimed to replace a 400 watt MH lamp, the comparison was made with a 350 watt MH system. As you can see, the energy savings is very respectable compared to the 350 watt MH system. Based on my energy provider’s rate of 10.24 cents per kilowatt hour, the Orphek PR-156 energy cost came in at $3.68 per month based on a daily 10 hour photoperiod, while the MH system cost $11.36 per month, and this does not reflect bulb replacement costs, and water cooling devices such as fans or chillers. 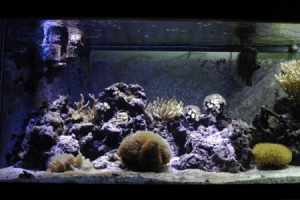 If you have a deep tank and are looking to cut back your energy usage along with eliminating bulb replacement and still provide the necessary light to grow corals, you will presently find no equal to the Orphek PR-156. Orphek has just informed me (10/18/10) that the units will be in limited supply until late December when International distribution begins. Pricey, but considering what a quality 250-400 watt MH single system costs, it begins to look much better, especially in lieu of the total savings gained total savings gained in energy consumption and lamp replacement costs.